Hey everyone. New guy here. 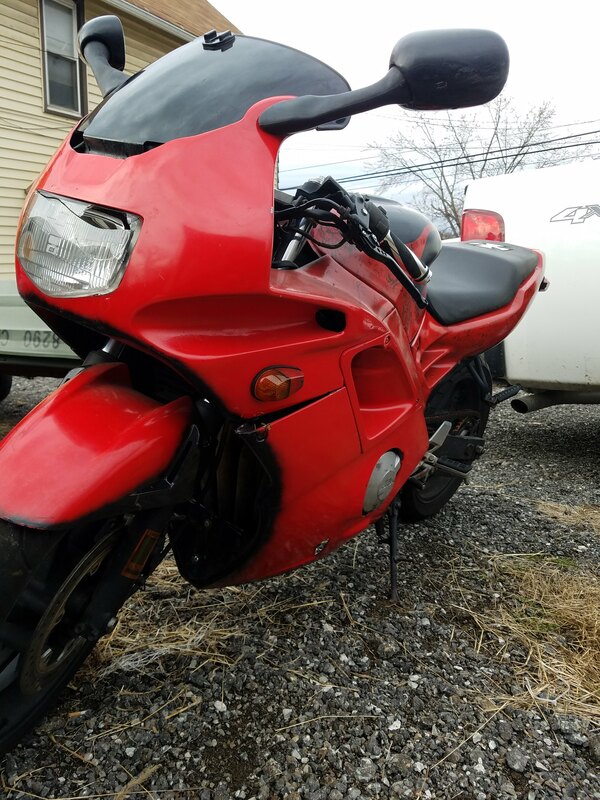 I recently purchased a 1993 CBR600F2 off a coworker for $250. He said he just had the motor replaced and it ran for a day then wouldn't start the next morning. He isn't a mechanically inclined individual which worked out to my advantage. I tore into it last night to clean and inspect the carbs and found the fuel line had been clogged up but what appears to be some kind of insect nesting. The fuel tank has a screen so i'm guessing the motor they put in had sat somewhere for a while which offered whatever a chance to nest and plug up the lines. After clearing the lines, changing out the gas and inspecting what turned out to be relatively clean carbs the bike fired right up. I couldn't be more excited! 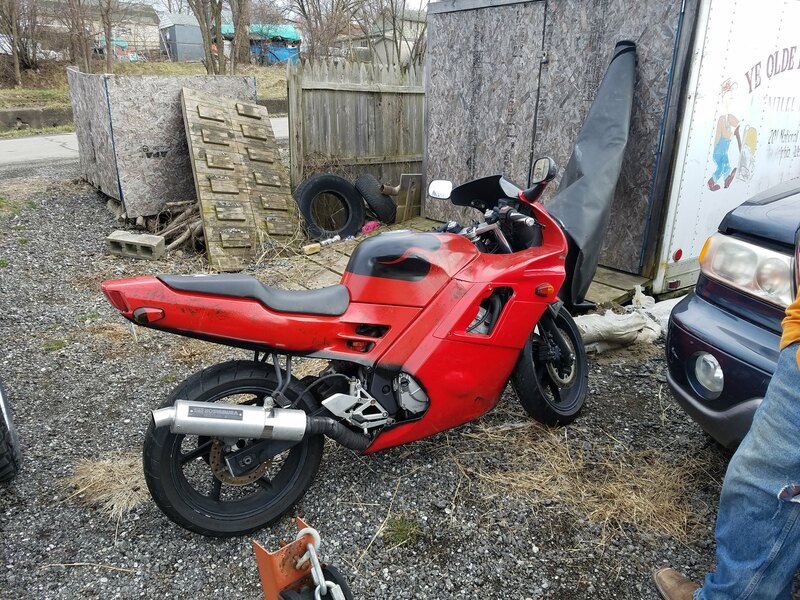 I also have a 2011 Yamaha R6 and bought this as a project bike/trainer bike that I hope to use to teach my fiance to ride. The fairings on the bike are kind of junky so I plan to clean them up and repaint (rattle canned currently). Thanks to everyone who has done write ups and assisted others with their issues as I have done a lot of reading of old threads in order to gain knowledge of these fine machines. If anyone has an extra set of L&R upper fairings feel free to shoot me a PM as I need to replace the crap fiberglass one piece that is on the bike now. My goal is to return it to stock-ish condition. Anyone have any recommendations for a slip on that is relatively quiet with maybe just a subtle tone to it? Maybe even a source for a factory replacement piece? Thanks in advance for any input. Im also considering repacking the Yoshimura that came on the bike to see if it makes any difference. What type of packing have you guys used? Have you found any to be better than others? Anyone tried FMF packing material? Since everyone likes photos here are a few from the day I went to look at the bike. Welcome to the forum, you got yourself a bargain! Indeed I did. The fiance wasn't thrilled with my decision at first but there was no way I was passing on this deal. She quickly got over it once the bike fired up without me spending any more money, plus I told her it can be hers if she learns to ride. Okay update time.. I've now replaced all the filters, some dry rotted hoses, and the rear brake pads. I initially pulled the rear wheel to clean, inspect and grease everything and found the rear pads were well worn, so I rebuilt the rear caliper and replaced the pads. I should probably replace the rotor too but the bike is not yet road worthy so it will have to wait. I found the clutch cable was adjusted WAY too tight and I was having trouble getting the bike into neutral. After a few minutes of adjustment its back to normal operation. I cleaned up all the hacked wiring for the lights and replaced the broken headlamp. I ordered a Motion Pro carb sync tool and new front pads today, so that will be the next line of business. Next purchase will be tires and a new chain/sprocket set. I've decided the yoshi pipe will be fine for the time being and am trying to decide what to do with the crap fairings. I want to piece together a factory set off ebay but for the $$ I could buy 2 sets of china specials. Anyone have an input on which route you would go and why? id go a set of cheap chinese because they can be made to fit ok, and a bike of this age becomes a money pit if you try to return it to mint stock condition. Yes, I have been realizing it watching Ebay for parts. Some of those vendors are out of control with their prices. I have a background in auto body repair and could make repairs to the "affordable" wrecked plastics but I don't know if it is worth the effort. Thanks for your input tigertim20r1! Progress update. Headlight has been replaced as the old was cracked. Tore down and rebuilt the front brake calipers as well as flushed the old fluid. Took it for a ride down the road and back. Realized in doing so that the shift linkage was improperly installed so I corrected it and went for another spin. Runs amazing! I still have a few more things to button up and then it is time for body repairs. On a more serious note. I have officially completed my first carburetor synchronisation! They were way out of whack but I got them dialed in and it runs SO much better now. Crisp throttle response, no more sputtering, its awesome! I still feel like it runs a little rich but it may just be me. Still have a small drip from either the petcock or fuel line to address but its not a big concern. I added it to my insurance the other day in anticipation of getting it registered sometime soon. It really needs a new chain/sprocket set and a back tire before I ride it any significant distance but I'd like to take it more than 100 yds down the road to see if I can pick out any other issues. Next step will be body repairs although I may just rattle can it for the summer then get replacement fairings next winter. I will likely rebuild the forks next winter also or else have them rebuilt. They feel to me like they have had some better days. Any suggestions for replacement springs for the forks?